Craig Purchase, associate professor of biology at Memorial University of Newfoundland, used a net to gather capelin for his research at Middle Cove Beach in Newfoundland. The silver fish spawning on the shore are the primary food source for cod. New England’s embattled fishermen want to believe it is a portent: To the north, in the waters off Newfoundland, the cod are coming back at last, bringing with them, perhaps, a way of life. PETTY HARBOUR, Newfoundland — Shortly after dawn, Tom Best prodded his rusting boat past the copper-colored cliffs of the continent’s most eastern point, until it was idling over the deep, frigid waters that were once home to the world’s most bountiful fishing grounds. The 70-year-old captain, like most other fishermen still working here, is old enough to remember better times. On a recent morning, as he eased up on the throttle and the Motion Bay came to a stop, he signaled to four grizzled men at the stern to cast their lines. Each lowered several specially designed hooks into the dark bay, unspooling their nylon lines by hand, like generations of Newfoundland fishermen before them. 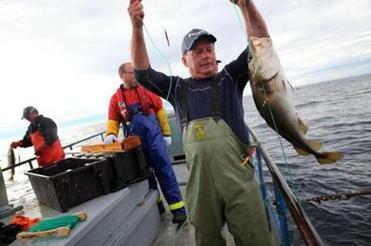 Cod populations are making a comeback, and towns on the Canadian coast are feeling the impact. But that way of life ended nearly a quarter century ago. After years of overfishing and damaging changes to the ocean environment, the Canadian government in 1992 banned nearly all commercial fishing of cod, an iconic species even more central to life here than in New England, where the fish stocks are also imperiled. The demise of the Grand Banks fishery left tens of thousands out of work, desperate, angry, and wondering if the fish, protected by the ban, would ever come back. Best and his crew weren’t fishing for themselves that day, but helping to seek a long elusive answer to that question. The results were immediate: In seconds, even with unbaited hooks, his men all had caught cod. And over the course of the next 3½ hours, as puffins swooped overhead and bursts of water shot from the spouts of humpback whales, the men pulled up one fish after another — an impressive 200 in all. The mix of ages — from young to mature fish more than 3 feet long — suggested a healthy population. On board with Best were a pair of government scientists — the kind of men whom fishermen long viewed with suspicion or resentment, as they tallied the depleted cod population and found way too few. The scientists aboard the 39-foot inshore boat used a ruler to measure each fish caught, then stapled a special tag along their dorsal fins before throwing them back. In the data they’ve been gathering, they’re starting to see promise. “There’s no question that we’re seeing more fish, and that we don’t have to spend as much time trying to find them,” said Dan Porter, a research technician with Canada’s Department of Fisheries and Oceans. Fishermen and scientists here haven’t just been finding more cod, they’ve been seeing a glimmer of something else that had forsaken fishing towns like Petty Harbour: hope. The rebound of the fishery has been a long-dreamed-of prospect here, one that resonates in New England, where fishermen barred from catching all but a few cod in the exhausted waters of the Gulf of Maine still wait for better days. 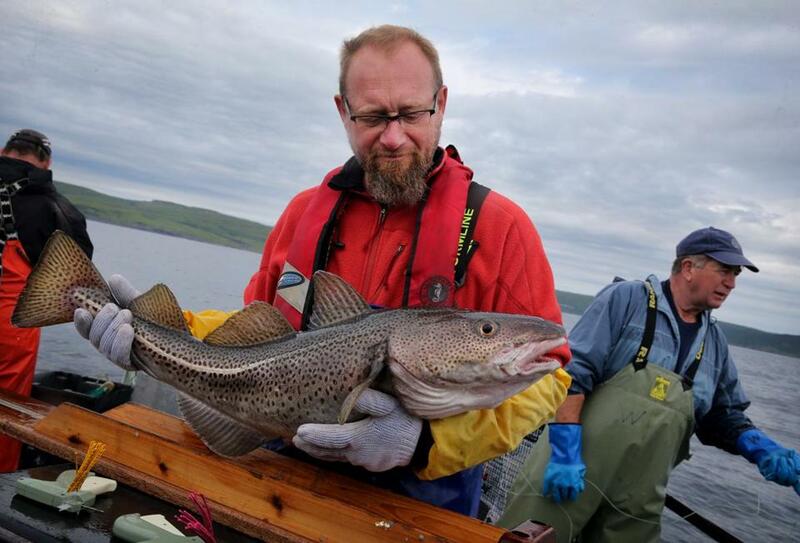 Dwayne Pittman, a researcher with Canada’s Department of Fisheries and Oceans, was impressed with the size of a cod while tagging the fish in Motion Bay. For more than 500 years, the iceberg-filled waters off Newfoundland’s craggy coast teemed with a seemingly endless supply of cod, so much that it sparked wars, drew immigrants from far away, and defined the rhythm of life. Here, cod have been so woven into the culture that most people refer to them simply as fish — as if there were no other. In the late 1960s, when times were good, local fishermen would catch some 800,000 metric tons a year of the olive-backed fish known as the northern cod. In the 1980s, their catch dropped by more than one-third, but the population still appeared relatively healthy. In 1987, the government estimated there were 940,000 metric tons of cod old enough to reproduce. But after years of overfishing, changing sea temperatures, and mismanagement, cod had virtually vanished. By the time Canadian officials declared the moratorium in 1992, they estimated the population of mature cod — which are vital to a sustainable fishery — had plummeted 60 percent in five years. Three years later, even after almost all fishing stopped, the population had dropped even more precipitously, to less than 10,000 metric tons of the adult fish. For cod fishermen in New England, where federal authorities two years ago declared a similar moratorium on commercial catches, Newfoundland’s experience provides lessons in the consequences of poor management, the possible impact of climate change, the long years — even decades — it can take for the population to rebound. Just as some 40,000 fishermen, processing plant employees, and others connected to Newfoundland’s cod industry lost their jobs as a result of the moratorium, fishermen from Cape Cod to Port Clyde, Maine, have also suffered under strict quotas as the Gulf of Maine cod stocks have fallen to just 3 percent of healthy levels. A storied industry that helped finance the American Revolution and brought so much wealth to the region that a wooden “Sacred Cod” has hung in the Massachusetts State House for more than two centuries is now at risk of dying. But in Newfoundland, there are now promising signs that the ecosystem is repairing itself. This spring, Canadian fishing authorities released a report suggesting that cod are finally making a comeback. The report found that the adult population of northern cod had more than doubled in size over the past three years, and it estimates that the spawning stock will double again within the next three years — bringing it two-thirds of the way back to a healthy fishery. The strict catch limits remain. But with an estimated 300,000 metric tons of cod now inhabiting local waters, and promising prospects for exponential growth, scientists and others say that within a few years, the government could substantially increase quotas, spurring the rebirth of a major cod fishery. George Rose, a recently retired professor of fisheries science at Memorial University in Newfoundland, has found similar evidence of the rebound in a survey he has been conducting for decades. He called the moratorium “essential” to the recovery. A view of Petty Harbour in Newfoundland. 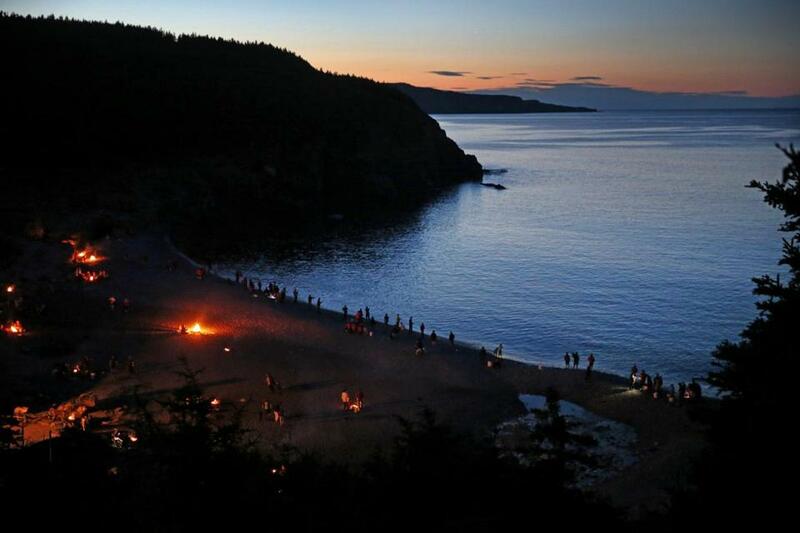 On a recent summer night, as a crisp dusk unfurled in spangles of gold and purple light, hundreds of people crowded along the edge of a rocky beach, their bonfires glowing behind them, beckoning their prey to shore. Many held nets, rods, and buckets. Only a few feet offshore, swarming in a dark cloud, were hundreds of thousands of small, silvery fish known as capelin, the foundation of the region’s marine ecosystem and cod’s main source of food. The fish, a kind of smelt, have been making a comeback, too — critical for everything from whales to seabirds — and are a delight to the crowd. From the shallows, people scooped up scores at a time, like candy from a jar. Some were also casting for the cod schooling just offshore, right behind the capelin. Until this summer, such fishing would have been illegal. But as the cod population has rebounded, authorities have relaxed the rules for the recreational fishery for the first time in years, allowing residents to catch cod nearly every summer weekend. “It’s the best I’ve seen it in 20 years,” said Keith Sparkes, 43, who waded into the frigid water with a rod and cast a line beyond the capelin. On the beach with him was Keith Power, who also came with hopes of catching cod. His grandfather was a cod fisherman, and he went to sea with him when there was still a robust fishery. Now, he wanted to show his 9-year-old son what he grew up with. 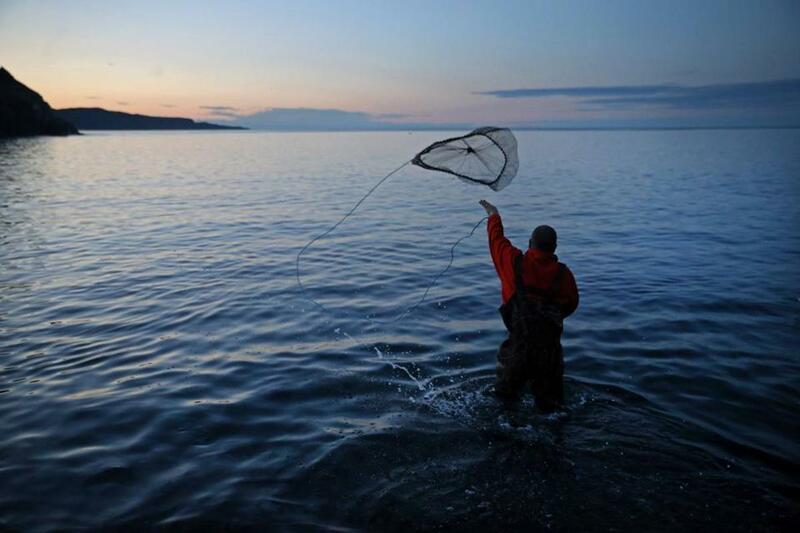 Scientists attribute the decline in cod to a drop in capelin, which nearly vanished in the early 1990s, as waters cooled to unusually low temperatures. Since then, cod and capelin have tracked a similar trajectory, and scientists say the warming waters — about 2 degrees higher on average than in the early 1990s — are contributing to their rebound. Cod and capelin thrive within a narrow band of temperatures, one potential reason for cod’s decline in the Gulf of Maine, which has been warming at a faster rate than nearly any other body of water on the planet, scientists say. Still, no one can say for sure why the fish are rebounding after so many years, said Craig Purchase, a professor of biology at Memorial University. He waded into the surf here in Middle Cove, just north of St. John’s, the provincial capital, casting a net to catch hundreds of capelin for his lab. By studying them, he hopes to better understand what caused their collapse and resurgence. On the other side of the peninsula, at the only Newfoundland plant still processing cod, Alberto Wareham has been envisioning a future with the return of a thriving fishery, something that until recently seemed implausible. In recent years, Wareham, whose family has been processing cod for seven generations, has built a state-of-the-art facility that operates now at just 40 percent of capacity. “We simply don’t have enough raw material,” he said. His company, Icewater Seafoods in Arnold’s Cove, is among the fewer than 100 fish processing plants still operating, down from about 280 before the moratorium, he said. Most process shellfish, particularly snow crab, which prefer cold water and have thrived as cod disappeared. But cod prey on juvenile crabs, and as the fish have rebounded, the ranks of crabs and other shellfish have thinned. Wareham expects much of the island’s economy will ultimately revert to cod, but he and other processors want the fishery to operate differently than before, to ensure that cod remains sustainable for the long haul. “We need to go slowly and stay in line with scientific recommendations,” Wareham said. At another processing plant in St. John’s, Paul Grant, executive vice president of Beothic Fish Processors, hosted a meeting of the Groundfish Industry Development Council, a newly formed group to help processors and fishermen find common ground after years of warring over prices and make plans for a major cod fishery. Sitting beside him, Bill Broderick, inshore director of the Fish Food and Allied Workers Union, whose membership has dropped by 60 percent since the moratorium, said he has been “really emotional” about cod’s return. The council had invited a local member of parliament to discuss increasing cod quotas, perhaps by as much as 500 percent. The parliament member, Nick Whalen, peppered the men with questions and scribbled notes as they answered. In the 1990s, politicians were blamed for failing to heed scientists’ warnings and caving to industry pressure. Whalen told them he supports a substantial quota increase. 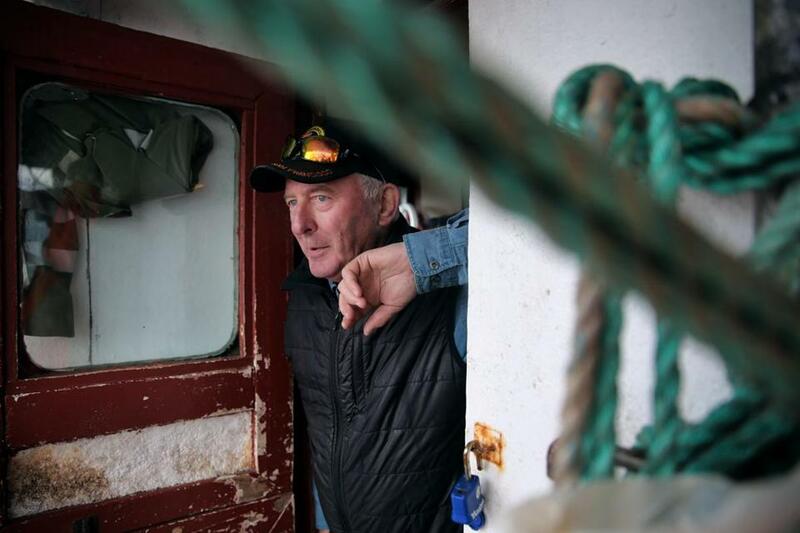 Skipper Tom Best watched over activities on his boat while working with a team of researchers from Canada’s Department of Fisheries and Oceans, who were tagging cod in Motion Bay. After Tom Best steered his 25-year-old boat back to Petty Harbour, the fishermen carried a cooler of the few cod they kept to their cooperative’s old processing plant, which closed with all the others shortly after the moratorium. The plant is now an aquarium, and they were bringing the cod to put on display for the thousands of visitors who come to Petty Harbour to see the remains of the bustling fishing community this once was. Upstairs, past the glass tanks filled with capelin and snow crabs, volunteers were installing insulation, new walls, and flooring to remake some of the old plant into a seaside center for business conferences. Crab pots were stacked where refrigerators used to be filled with processed cod. Outside the door, aging fishing boats teetered on wooden scaffolds, moldering in dry dock. If the plant is ever to process fish again, it would have to rely on hand-caught cod stored in saltwater tanks and then carefully filleted, Best said. That’s how it’s done in Iceland and Norway, Newfoundland’s major competitors in the cod fishing trade, and what the market expects. Such big changes, he said, would require too much of him and many of his colleagues. Too much to learn and do. A new generation will have to greet the returning fish.